The skeleton of a T rex named Trix is installed in a room of the Naturalis Museum of Leiden, Netherlands on September 9, 2016, during the exhibition "T rex in Town"
Tyrannosaurus rex had scales, not feathers, said a study Wednesday which rescues the giant lizard's reputation as a fearsome killer with a rough-and-tough hide. Recent research has claimed to provide evidence for feathers in ancestors of T. rex, and suggested the iconic carnivore may itself have sported bird-like plumage rather than reptilian scales. Those findings challenged a long-held contention that large-bodied dinos had no feathers, requiring them for neither warmth nor flight. For the new study, an international team of scientists tracked down museum samples of skin from T. rex and several of its cousins in the tyrannosaurid family, and compiled a database of fossilised hide impressions. These included skin patches of the neck, pelvis and tail of a T. rex from the Houston Museum of Natural Science, as well as samples from four other members of the extended tyrannosaurid family. That group roamed the planet during the Late Cretaceous, which extended from 99 million to 65.5 million years ago, when an asteroid slammed into Earth and wiped out all land-dwelling dinos. The team concluded that "extensive feather coverings" in tyrannosaurids—which lived much earlier—were already lost in the common forefather of T. rex and its cousins about the time the Late Cretaceous began. 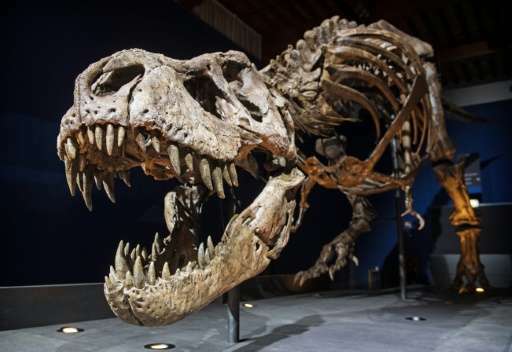 The data provides "compelling evidence" of an entirely scaly covering for T. rex, the team wrote in the Royal Society journal Biology Letters. "Our discovery of fossilised scaly skin similar to that of modern reptiles on the bodies of a wide variety of tyrannosaur species (including T. rex)... paints a more traditional scaly-skinned picture of these huge predators," they wrote in a press summary. This suggested, in turn, "that most (if not all) large-bodied tyrannosaurids were scaly and, if partly feathered, these were limited to the dorsum (back)," they wrote. The study begged the question of why—after T. Rex's ancestors evolved feathers from an even more ancient scaly forebear—the giant tyrannosaurs reverted back to scales. Paleontologists believe the first birds appeared 150 million years ago and were descendants of small feathered dinosaurs. The first dino feathers were simple hollow shafts, which evolved over time into something resembling their modern shape, engineered for flight. Interesting that there are apparently no existing featherless birds. Wonder why? I don't get the black/white thing on this. I thought the evidence was that it was feathery in youth, then lost them. Are they saying, "Never"? I'm not really getting the import of this one. I think we always knew adult T. Rex wasn't feathery in maturity. That said, it's interesting how his little forearms make much more sense if you look at the skeleton of an ostrich. Perhaps t rex subspecies in subarctic regions had feathers like mammoths had fur. Yeah. I think these subarctic dinos are interesting vis a vis global winter and the extinction asteroid. It had to be more. Unless the arctic was really warm, some should have survived cold temps. The new studies on sulfur in the shallow water asteroid impact seem to explain that, though. Dinosaurs did indeed live in the arctic. Even NOVA did an episode. T-rex are both covered by scale and feathers.